Saving money for students, mommies & daddies, brides, and Pittsburghers. This post may contain affiliate links. For more details, please view our full disclosure. A couple of years ago, the husband’s bank started charging him a monthly service fee on his checking account. The fee? Seven dollars per month—that adds up to $84 in service fees a year just for the one account. On top of the fees, his interest rate was terrible. The customer service was nothing exceptional. At first, the process seemed a little daunting. After we got into it, though, we realized it was little more than a mild inconvenience. The decision to transfer his accounts to a new financial institution was going to save him $84 plus per year. Even with that seemingly low dollar amount, the effort was worth the reward. Location and convenient accessibility. While this reason is dissipating more and more everyday with the advent of digital banking, it may be cause for concern if one of the following apply to you: you work for cash tips and need to make frequent deposits, or you prefer the convenience of a physical branch to conduct certain types of transactions that you find easier to do at a physical branch location. The biggest reason why I would switch financial institutions? Interest rates If someone is going to offer me a better rate of return on all my deposits, then switching is a sound fiscal idea. For example, PenFed’s Access America Checking offers dividends with a monthly direct deposit of $500 or more and a daily balance up to $50,000 per statement cycle. Even better, PenFed’s Access America Checking account has no monthly service fee if you have a daily balance or monthly direct deposit of $500 or more. And what’s even better than better? Extras like: mobile access, more than 57,000 surcharge free ATMs, a chip-enabled debit card, and $0 liability on unauthorized debit card purchases. This may seem like an obvious thing, but we live in a world of automatic payments and monthly subscriptions. Make sure you know how much money is in your account and address any upcoming payments. If you’ve recently bought something on debit or credit in the past few days, be aware that the transaction may not be reflected on your available balance yet. After you know how much money you have, take out enough cash to last you a few days while your finances are in transition mode. You will have to fill out an account application and make an initial deposit. Be sure you have information on hand to verify your identity such as social security number, full mailing address, etc. Depending on the efficiency of your HR Department, this process can take a few minutes or a few days. All you’ll need to do, though, is fill out a new ACH form identifying your name, checking account number, routing number, and possibly employee ID. Reach out to your HR department to get the correct forms. They can also answer any specific questions or concerns that arise along the way. If you are a contractor with multiple clients, repeat this step for each client that pays you through direct deposit. You can include this in step two if you wish, but make sure you transfer the remainder of your balance from your old institution to your new one. This can take a few days, which is why that cash from step one is so important. Because you identified all those automatic payments in step one, this should be a breeze. Simply call up customer service or log onto your online account to change the financial institution on record for payments. The mild inconvenience of switching is well worth avoiding fees and gaining interest or dividends. 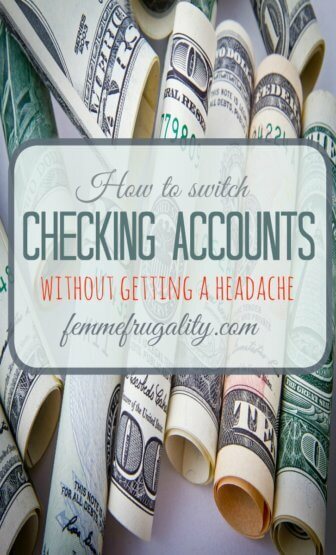 Once you’re through it, you’ll have more cash in your checking account. Which makes everyone all the happier. This entry was posted in Money Management on December 22, 2016 by femmefrugality. Changing banks isn’t as hard as it seems! Good job on saving that extra money! Thanks, Kate! And you’re right—it’s not as intimidating as it seems! It can certainly seem like a daunting task at first but if you stick with it — it’s totally worth it when you start reaping the benefits of lower rates on loans and higher returns on investments. This blog is written for entertainment purposes only. I am not a financial professional in any way shape or form. 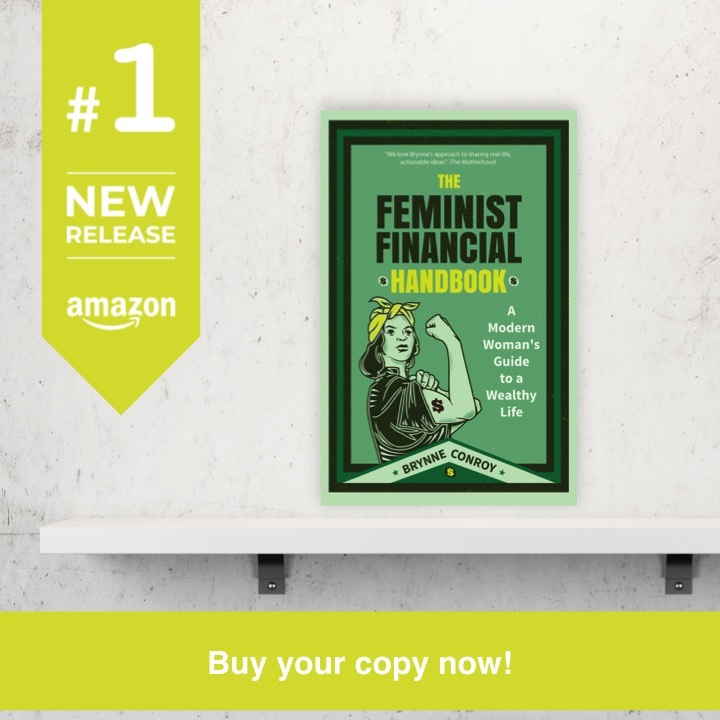 The information that is found here are my opinions and the opinions of other readers and should not be taken as financial advice. I try to only post about things I think will be helpful to my readers and have experience with, but anything that happens as a result of you using the information provided is your responsibility alone. Become one of the cool kids. Subscribe to the newsletter.